Sophomore Kendall Brown tallied a game-high 24 points, powering the Raptors to victory. 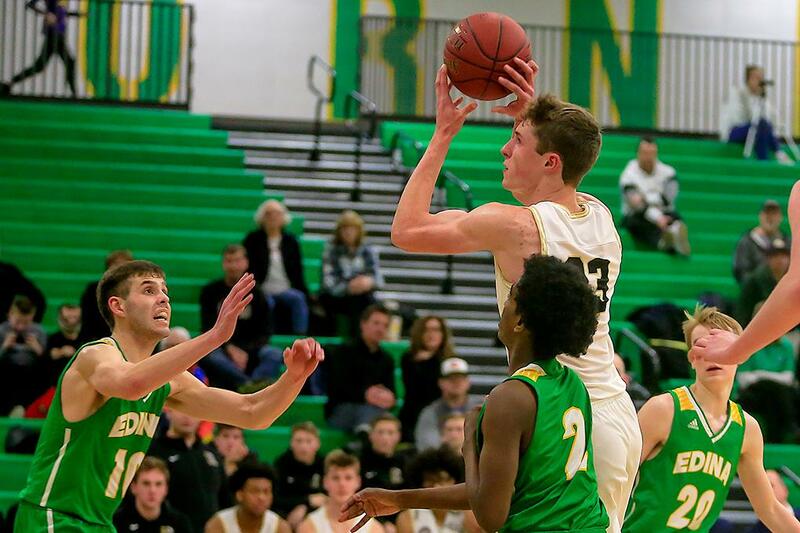 East Ridge fended off a formidable Edina team with a 7-0 run late in the second half to secure a 72-68 victory at Edina High School on Friday. Sophomore guard Kendall Brown made sure to give East Ridge enough distance from Edina (10-7, 1-2) when he started the 7-0 run on a drive off a screen for a layup. It broke a 62-62 tie that lasted about two minutes, and the Raptors (15-2, 8-0) led the rest of the way. “We just had to play defense, and get stops and get rebounds because rebounds killed us in the first half, so once we got those, we were good,” Brown said. Brown led East Ridge, ranked No. 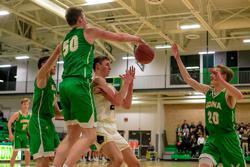 4 in Class 4A by Minnesota Basketball News, with 24 points in the team’s first game back since the recent polar vortex led to most school districts being closed part of the week. Edina hadn’t played a game since Jan. 25. Both East Ridge and No. 9-4A Edina had only two practices during the week with the school cancellations. Neither team showed much rust from three-point range on Friday as the Hornets buried seven three-pointers, and the Raptors connected on eight. Edina built a first-half lead on three-pointers with baskets from Charlie Haff, and Zak Haji, giving it a 26-19 lead with 6 minutes, 12 seconds left. East Ridge, which extended its winning streak to 12 games, trimmed the lead with a three from junior forward Ben Carlson to make it 30-25 with 4 minutes, 29 seconds remaining in the half. Carlson later put the Raptors ahead 32-30 with a basket during a 9-0 run. Brown kept East Ridge ahead with a dunk off a lob pass, followed by a spin in the post for another basket for a 38-34 lead with 1:32 on the clock. He had 12 of his 24 points in the first half. Despite running into early foul trouble in the second half, Edina kept fighting and took the lead, twice. Senior guard Jake Middleton drove home a dunk and made a three-pointer to give the Hornets a 41-38 edge, however the Raptors answered with a three from senior guard Zach Zebrowski, tying it 41-41. East Ridge went on 9-4 run capped by a basket from Carlson, who finished with 16 points, for a 50-45 lead. Edina didn’t go away with another Middleton three, a basket by senior guard Tommy Denn and another basket by Haji to pull within a point, 53-52. Middleton tied it 55-55 with a three-point play. “We’re a scrappy team. We’re never out of the game,” said Middelton, who scored 18 points. Haff then got a steal, which led to a score by Haji for a 57-55 Edina lead with 7:03 left in the game. But Brown put the Raptors back ahead with a three-pointer, then stretched the lead to 60-57 with a basket before initiating the game-deciding run. 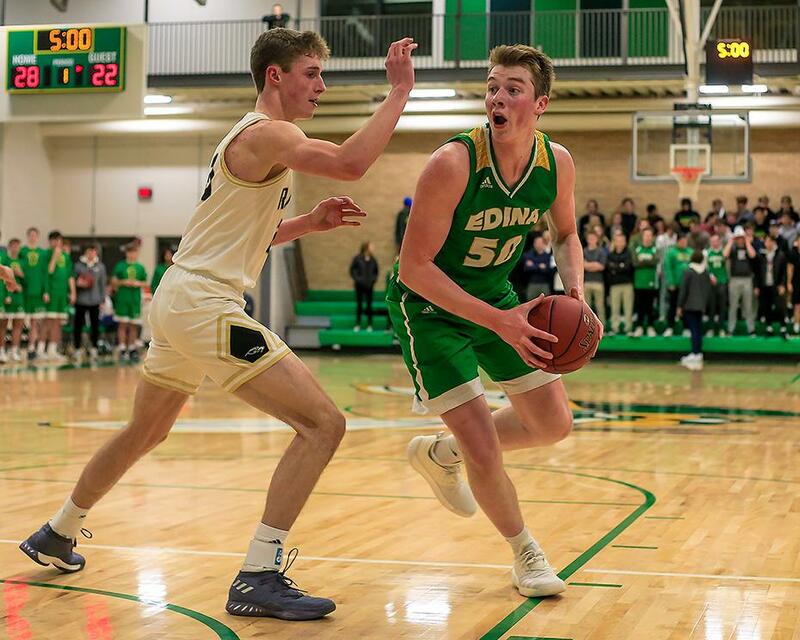 Down 69-62 with 1 minute, 25 seconds left, Edina tried to chip away at the lead with free throws from Jacob Hutson, who scored 23 points in the game, and Haff. The Hornets trailed 72-68 with 18.7 seconds left but couldn’t buy a basket with three misses inside the lane. 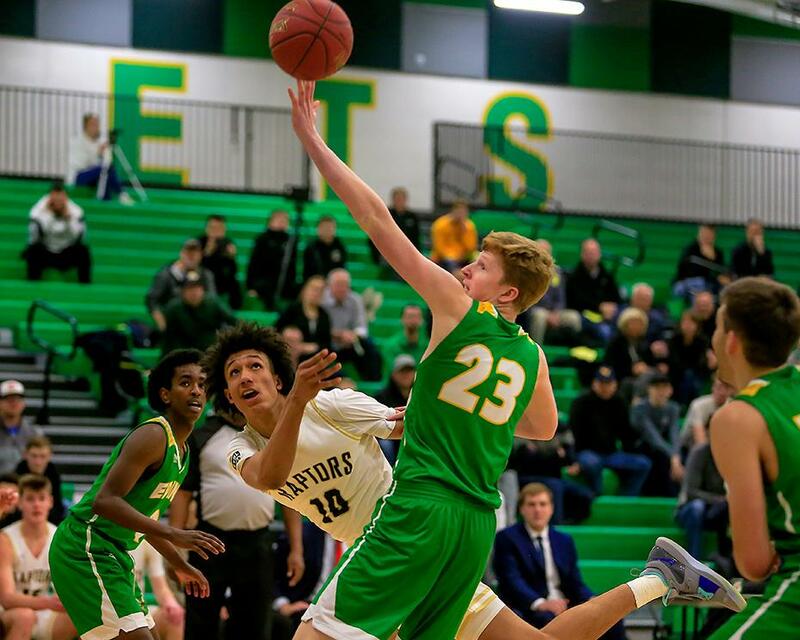 East Ridge went fended off a scrappy Edina team with a late 7-0 run to secure a 72-68 victory over the Hornets at Edina High School on Friday night. Raptors sophomore Kendall Brown, a 6-foot-7 guard, started the run with a drive off a screen for a layup with less than three minutes left in the game. The basket broke a 62-62 tie that had lasted about two minutes, and the Raptors (15-2, 8-0) led the rest of the way. Brown led East Ridge, ranked No. 4 in Class 4A by Minnesota Basketball News, with 24 points. East Ridge’s Ben Carlson, a 6-foot-10 junior forward, contributed 16 points. Senior guard Patrick Lynott and junior forward Brody Kriesel added 10 points apiece. Edina (10-7, 1-2) tried to chip away at the lead with free throws. The No. 9-4A Hornets trailed 72-68 with 18.7 seconds remaining but couldn’t buy a basket with three misses inside the lane. Jacob Hutson, a junior forward, led the Hornets with 23 points. Senior guard Jack Middleton scored 18. The win extends East Ridge’s winning streak to 12 games. The Raptors last lost 55-50 to No. 8-4A Eden Prairie on Dec. 18. The MN Basketball Hub poll is for entertainment purposes only. View which players were honored from all four classes.